Gudvir and his wife Suman hails from agri family from village Gaid of Tehri district. Having spent most of their formative years in inner Himalayas, they are at peace with the ethos of our lodge. Be it snow or rain, you will see Gudvir and somender run around with unmatched energy the best thing is - the smile on their faces is perennial... as if they only know to say - "Ji Sir" to anything you may ask for! He has two sons - Abhay and Akshay, one darling daughter - Riya. His old mother is great support to the entire home and his father's primary duty is to look after the livestock. He is the bread earner for the entire family. He is blessed with exceptional cooking talent specially when it comes to Indian cuisine. His local dishes are something to die for - if you are in winter time, do venture with local sarso sak, makke roti, Rye ki subzi , aloo with zakia, barbeque chicken , mutton biryani and list goes on! Shy by nature but be assured, he is watching you from the kitchen and will go out of his way to make your stay filled with good food of your choise! Do not hesitate to call him and let him know how you like your food cooked - home style / spicey etc etc. 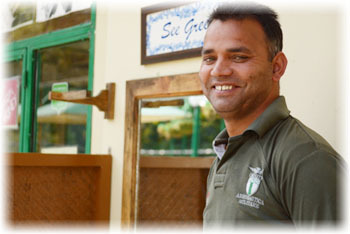 Somender Singh - the caretaker of the lodge and 'Man Friday' for you while you are staying with us. Young lad from Thathyur district, he is bubbling with energy and will run around to ensure the housekeeping and the serving. He could be little harsh with his words at times but means no harm ~ it is just that he is protective about the lodge and its rules. Somender is a local villager - his childhood is filled with interesting stories of close encounters with bears and leopards - he went walking to a local school about 15 kms walk everyday , would return home and look after his fathers livestock and live in 'chappar' (local small hut made of local grass and mud) till late in the evening - return home for supper and back to school next day!! In spite of our best efforts, he has not yet managed to clear his graduation and this is his first job. Never worked anywhere before. His strength is his silent and non intrusive way of serving and looking after your needs. 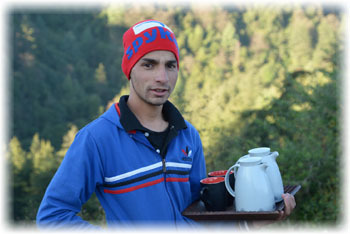 Gets annoyed when rules are not followed and aspires to grow with the lodge in the mountains. 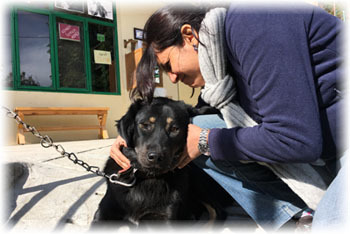 we got him to Bombay few months ago and he felt so lost, we had to pre book him and send him back. 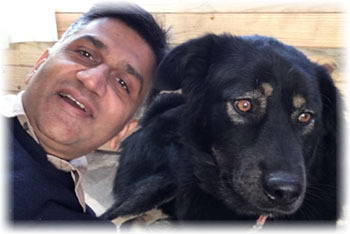 Moogli - Your watch dog and our security guard at the lodge - he once again hails form higher Himalayas - Not a pure breed Bhotiya - he is a power house and sturdy companion on all our walks - be it early morning or late into those dark nights - I cant even think of a walk without moogli. We love him, we adore him and would love to see him left free. However, if you are not fond of dogs, we understand that he can be a pain - Just let somender know and he will ensure mOOgli is shifted to his home on the adjoining land.